One of The Beatles' most successful singles, Hey Jude/Revolution was issued in the US on this day. It was also the group's first on their Apple label, and had the catalog number Apple 2276. Hey Jude was a huge success in America, spending a total of 19 weeks on the charts from 14 September. The previous day it was certified gold by the Recording Industry Association of America. The single topped the US Billboard chart for nine consecutive weeks, from 28 September to 23 November 1968. It was the longest time spent by a Beatles single at number one, and also set the record for the longest US number one single. Additionally, as some US charts counted a- and b-sides separately, combining sales and airplay for their rankings, at one point Record World had Hey Jude at number one and Revolution at number two. 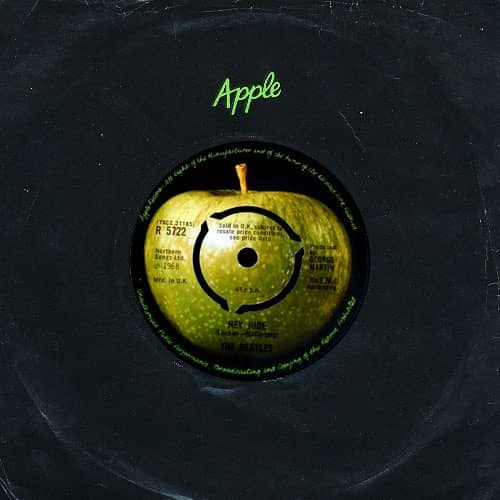 Also on this day, Mary Hopkin's single Those Were The Days, produced by Paul McCartney, was issued as Apple 1801. McCartney also wrote and produced the Black Dyke Mills Band's single Thingumybob/Yellow Submarine, which was released today as Apple 1800. Additionally, Jackie Lomax's Sour Milk Sea, written and produced by George Harrison, was issued in the US as Apple 1802.